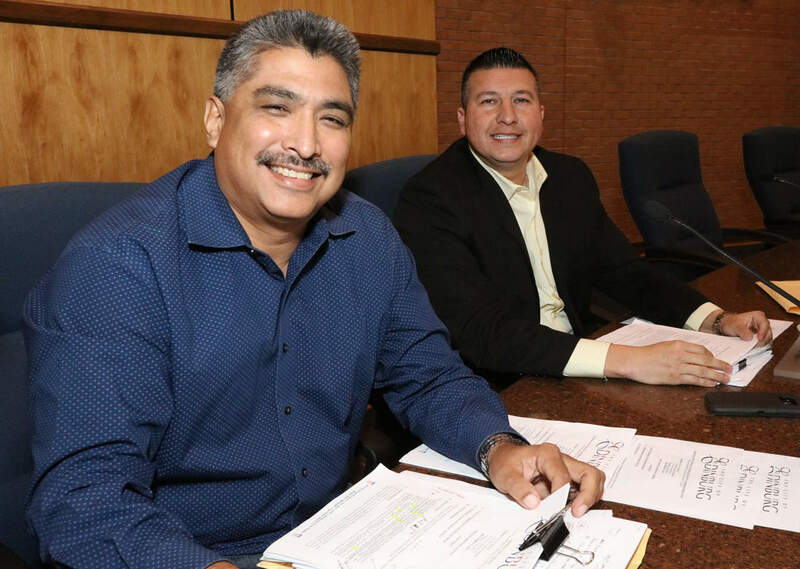 Featured, from left: Councilmember David Torres and Councilmember Richard Molina on Monday, December 12, 2016, at Edinburg City Hall prior to a joint work session between the Edinburg City Council and the Hidalgo County Commissioners Court, to sign a Memorandum of Understanding relating to the city’s participation and financial contributions to a planned $150 million Hidalgo County Courthouse to be built downtown. Edinburg led major Valley economies with 4.57 percent growth rate from January through October 2016, compared with the same period last year, while statewide, all cities combined showed only a one percent increase, according to the Texas Comptroller of Public Accounts. For the month of October 2016, Edinburg’s retail economy – as measured by local sales taxes generated from purchases of eligible goods and services – had the third-best showing among the Valley’s largest cities, coming in with a 4.86 percent improvement over the month of October 2015. Those figures are based on sales made in October 2016 by businesses that report tax monthly. During the first 10 months of 2016, Edinburg’s retail economy produced $21,171,250.82 in local sales taxes, compared with $20,245,270.46 for January through October 2015, representing an improvement of 4.57 percent. For October 2016, Edinburg’s retail economy generated $1,644,571.30 in local sales taxes, compared with $1,568,278.46 during the same period in 2015, representing the improvement of 4.86 percent, also according to the Texas Comptroller of Public Accounts. The local sales tax is used in Edinburg to help pay for many city services, while the Edinburg EDC uses its one-half cent local sales tax to help generate economic development in the city. The Edinburg EDC, of which Agustín García, Jr. is Executive Director, is the jobs-creation arm of the Edinburg Mayor and Edinburg City Council. The Edinburg EDC Board of Directors is comprised of Mayor Richard García as President, Harvey Rodríguez, Jr. as Vice President, Elías Longoria, Jr. as Secretary/Treasurer, and Richard Rupert, and Dr. Peter Dabrowski as Members. Edinburg led major Valley economies with 4.57 percent growth rate from January through October 2016, compared with the same period last year, while statewide, all cities combined showed only a one percent increase, according to the Texas Comptroller of Public Accounts. For the month of October 2016, Edinburg’s retail economy – as measured by local sales taxes generated from purchases of eligible goods and services – had the third-best showing among the Valley’s largest cities, coming in with a 4.86 percent improvement over the month of October 2015. Those figures are based on sales made in October 2016 by businesses that report tax monthly. The local sales tax data is among the latest economic barometers featured in a detailed summary provided by the state comptroller’s office, which released retail sales figures on Wednesday, December 7, 2016. The Edinburg EDC Board of Directors is comprised of Mayor Richard García as President, Harvey Rodríguez, Jr. as Vice President, Elías Longoria, Jr. as Secretary/Treasurer, and Richard Rupert, and Dr. Peter Dabrowski as Members. Texas Comptroller Glenn Hegar announced on Wednesday, December 7, 2016 that cities, counties, transit systems and special purpose taxing districts combined generated $627.6 million in local sales taxes allocations in October 2016, which represents 0.2 percent more than in October 2015. Weslaco had the best showing for all major Valley cities for the month of October 2016, registering a 9.04 percent improvement over October 2015, followed by Pharr (5.58 percent) and Edinburg (4.86 percent). Based on local sales taxes generated, McAllen had the best showing in terms of revenue for October 2016 ($4,254,734.05), followed by Brownsville ($2,718,614.17), Harlingen ($1,702,513.47), and Edinburg ($1,644,571.30). During the first 10 months of 2016, Edinburg’s retail economy produced $21,171,250.82 in local sales taxes, compared with $20,245,270.46 for January through October 2015, representing an improvement of 4.57 percent. For October 2016, Edinburg’s retail economy generated $1,644,571.30 in local sales taxes, compared with $1,568,278.46 during the same period in 2015, representing the improvement of 4.86 percent, also according to the Texas Comptroller of Public Accounts. Weslaco: $881,823.37, up 9.04 percent compared with October 2015 ($808,705.70). Weslaco: $11,679,765.20, down 0.18 percent compared with January through October 2015 ($11,701,640.39). All cities in Hidalgo County reported a total of $11,265,937.08 in local sales taxes during October 2016, compared with $11,198,064.26 in October 2015, an increase of 0.61 percent. Year-to-date (January through October 2016), all cities in Hidalgo County registered $151,223,646.05 in local sales taxes, compared with $151,708,691.57 for the same 10 months in 2015, a decrease of 0.32 percent. All cities in Cameron County generated $5,318,852,02 in local sales taxes during October 2016, compared with $5,390,140.54 in October 2015, a decrease of 1.32 percent. Year-to-date (January through October 2016), all cities in Cameron County registered $72,636,315.89 in local sales taxes, compared with $70,924,045.88 for the same period in 2015, an increase of 2.41 percent. All cities in Starr County produced $383,458.45 in local sales taxes during October 2016, compared with $398,577.98 in October 2015, a decrease of 3.79 percent. Year-to-date (January through October 2016), all cities in Starr County registered $5,315,480.56 in local sales taxes, compared with $5,384,193.94 for the same period in 2015, a decrease of 1.28 percent. All cities in Willacy County produced $101,893.59 in local sales taxes during October 2016, compared with $119,163.26 during the same month in 2015, a decrease of 14.49 percent. Year-to-date (January through October 2016), all cities in Willacy County registered $1,481,304.72 in local sales taxes, compared with $1,547,738.26 for the same period in 2015, a decrease of 4.29 percent. SO WHAT DOES THE TEXAS COMPTROLLER DO, ANYWAY? Even though the Texas Comptroller’s office has been around in one form or another for more than 180 years, many know very little about this agency, and its role in serving Texans. In this issue, the Comptroller’s Office also introduce a new feature — online-only content that provides a deeper look into their stories and topics. It’s their way of helping Texans get the most out of each issue. Published monthly, Fiscal Notes is online at comptroller.texas.gov/economy/fiscalnotes, and can also be received by subscribing via the Comptroller’s website. To learn more about the Comptroller’s office, go to our video library.